Ringwoodite blue crystal ~ 150 micrometers wide. Microphotograph taken at the University of Hawaii of a specimen grown in Bayreuth, Germany. Author: Joseph Smyth . Header image: The blue ringwoodite material. Steve Jacobsen, 2014. Ringwoodite is the most common mineral phase in the lower transition zone of the Earth’s mantle, at depths of 525 to 660 km. This ringwoodite crystal contains about 1% water. If the whole ringwoodite of the mantle contains this amount of water, it is estimated that there is almost three times as much water in the mantle as in all the oceans combined! Cross section of the planet Earth ( Pearson et al, 2014 ). Credit image: Kathy Mather. 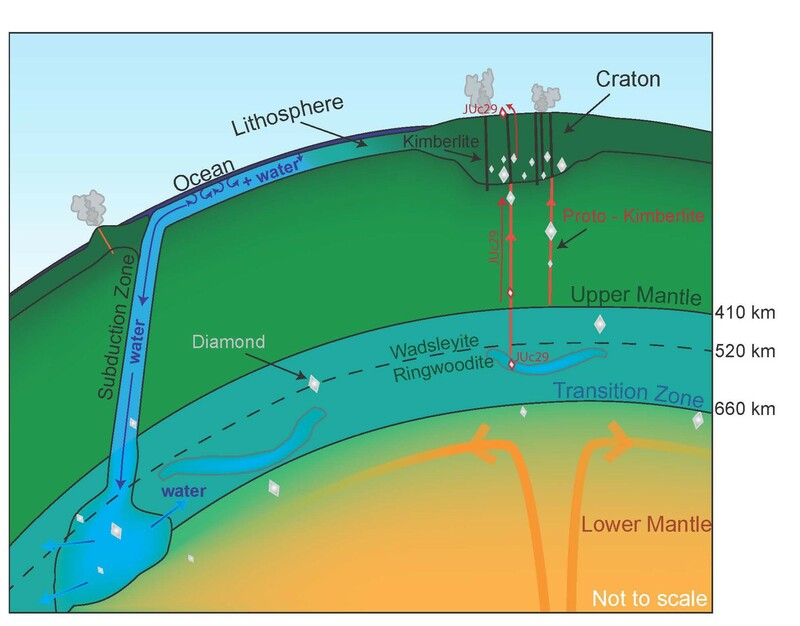 At closer look into the cross section of the planet Earth we can identify the transition zone that separates the upper mantle from the lower mantle. Right there, diamonds are formed and together with the included ringwoodite -which in turn traps the water molecules- both minerals continue their journey to the surface through volcanic activity. 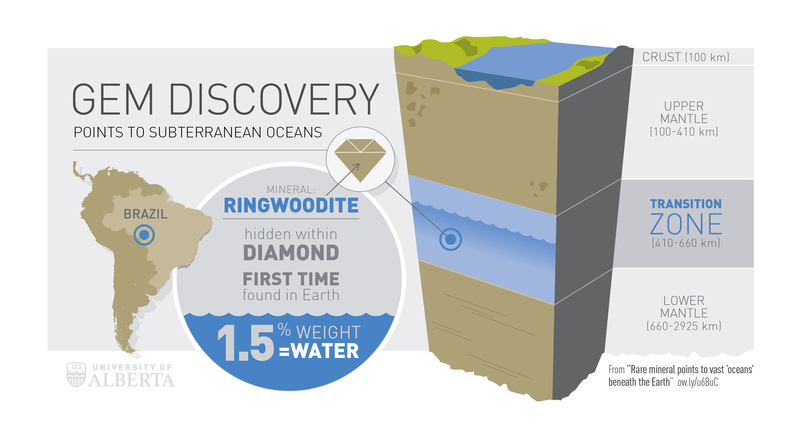 The first discovery on Earth of ringwoodite inside a diamond was made by an international team led by the University of Alberta and could indicate the presence of large amounts of water between 410 and 660 km below the Earth’s surface. Credit: University of Alberta. Source: phys.org. The diamond found in Brazil originated approximately 550 km below the earth’s surface, where large masses of water can accumulate by subduction and by the advance and recycling of the ocean floor towards the transition zone. The results of these investigations were published in 2014 by Pearson et al. (2014) in the journal Nature. Cross section of the Earth’s interior. Simultaneously, the study by Steve Jacobsen and Brandon Schmandt used seismic waves to find magma generated at the base of the transition zone, around 600 km deep. Dehydration melting at those conditions, observed in the study’s high-pressure experiments, also suggests the transition zone may contain oceans worth of H2O dissolved in high-pressure rock. The findings alter previous assumptions about the Earth’s composition.